The ratings for Switched at Birth continued to fall last season but ABC Family renewed it anyway, likely in part to give them enough episodes for a syndication package. Could the ratings improve this time around? Cancelled or renewed for a fifth season? Stay tuned. Switched at Birth follows the lives of two teenage girls after it’s discovered that they ended up with the others’ families as babies at the hospital. The cast includes Vanessa Marano, Katie Leclerc, Lea Thompson, Constance Marie, Sean Berdy, D.W. Moffett, Lucas Grabeel, and Giles Marini. Below are the show’s TV ratings, typically the best way to tell if this new TV series will be cancelled or renewed. These figures will be updated as the weeks progress so you can track how it’s doing. 10/21 update: ABC Family has renewed Switched at Birth for a fifth season. Details here. Final season averages: 0.43 rating in the 18-49 demographic with 1.02 million total viewers. For comparisons: Season three of Switched at Birth averaged a 0.6 rating in the 18-49 demographic with 1.42 million total viewers. What do you think? Do you like Switched at Birth TV series? Do you think that it should be cancelled or renewed for a fifth season? 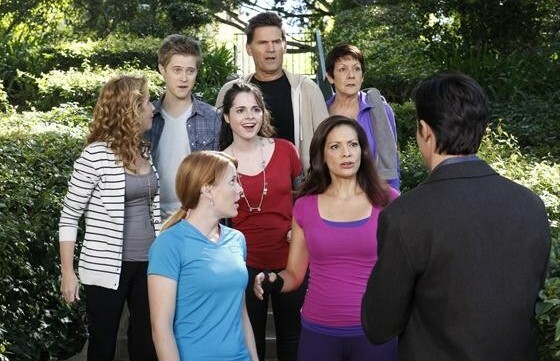 Switched at Birth: How Many New Episodes Are Coming?